My texas 200, or change of plans to Plan B and then Plan C, and so on …….. I was ready and prepared for the Texas 200 this year, after a series of missed events but even that fell off the “done list”. 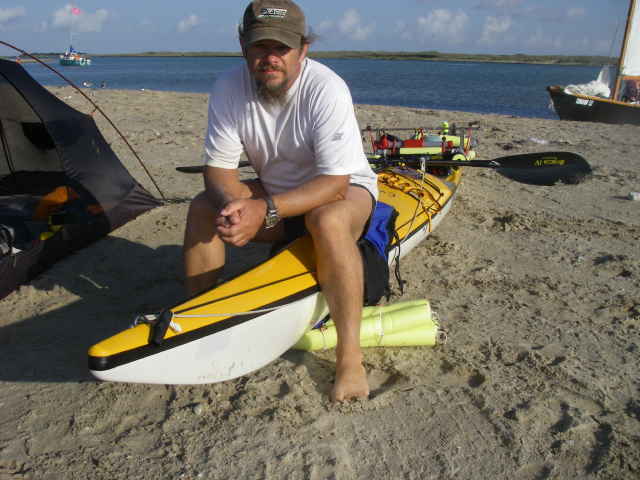 Originally I wanted to do the 260 mile Texas Water Safari (TWS), but then I got the idea I wanted to do the 1200 mile Ultimate Florida Challenge (UFC) in march of 2012 but first had to qualify by doing the Everglades Challenge (EC). The Cross Florida Challenge (CFC) was dreamed up as another qualifier so I was going to do that instead of the EC which was at the same time as the TWS so it was decision time. I wanted the UFC so I had to do the CFC so the TWS was out. Then the CFC got cancelled but I was already too far down the road to start over for the TWS so that’s when the TX200 came onto the list. Preparing for the CFC was just about like the TX200, same boat, same gear, etc., I even was gonna bring my portage cart for the TX200. All the same gear so this would be a good shake down for any of my other long distance adventures I got schemed up for the future. So what route was I to take? I had already paddled the bay side that far last year so was looking for something different. 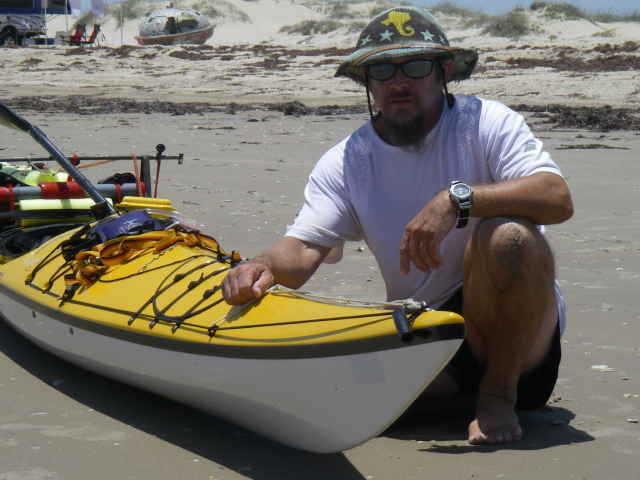 Paddling on the outside was high on my list, and since I had already paddled the entire texas coast on the bay side, my next goal was to do it on the outside. The TX200 seemed like a good place to see if this was a possible goal or not and make a great shake down cruise. I thought Cedar Bayou would be my access point into the bay from the gulf and would be the site of camp 5 and I could hook up with everyone else there, if they made it that far. I could always bail out at a few places if the gulf got to be too much, but i pretty much had the route set for the outside. The phone call. “Hey did you know we got a job on Thursday?” This was the call that woke me up the day before I was to paddle away from south padre. Now what? I really need the bucks and knew the TX200 was cancelled for me. I went into some dark depression for the rest of the day . This is my busy season for my sandsastle instruction classes and somehow got lucky up to this point with things being slow but I really needed the bucks, dang it! As my depression ate at me I started thinking about what else I could do, as I always got another plan in mind. What Plan is this now? A, B, C, D, E, F, G, or what? I’ve lost count! So one of my training routes for the CFC was to circumnavigate south padre island so this seemed like a good time to do this. I could start out with the TX200 outside group and meet up at camp 1. It would be a 40 mile day, a long one and as it turned out it was 14 hours, starting at my house just north of Louie’s Backyard. As I made it to the Brownsville Ship Channel near Dolphin Cove, the sailboats were just entering the gulf. After rounding the jetties I stayed about that far offshore angling towards shore by the time I made it past the city limits. From there it was just a series of zip zags between staying off shore and the third sandbar. Later on in the day, as the tide went out, the waves began to trip and break on the third sandbar and it began to get a bit hairy out there. I decided to go in and find the first sand bar lagoon and follow that. On the spot tracker a friend of mine thought that I had switched to portage mode because it looked like I was on land during that time. At times I was only a paddle length away from the shore as I made my way as the tide went out. It started out like a lagoon, then a river, to a stream and then a creek and when it got so shallow I had to drag across the sand bars into the next little lake I finally went back out some. The third sandbar was a magtag so I picked my way between the 2nd and 3rd for a bit, then got caught in a wash that brought me all the ways in. 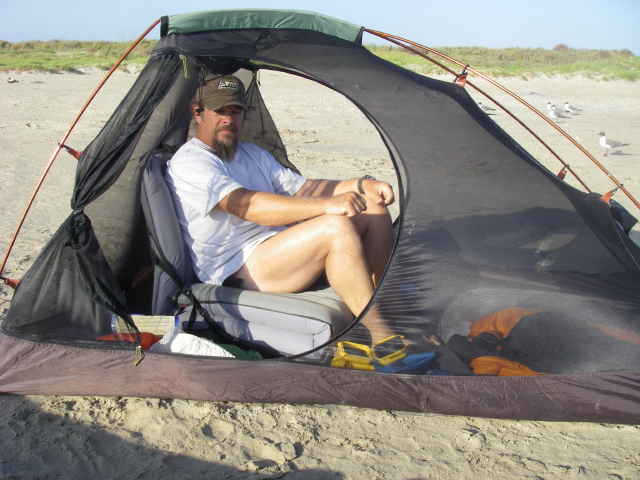 I was about a mile from the jetties, so I tested out my portage cart in the sand. It was meant for the CFC and roads so this would be interesting with a full set of gear. She had some rolling resistance because of the sand, but overall not too bad. I’d not want to do 10 more miles this way though! Getting to the Jetties who do I see walking towards me? Chuck and his wife! Ok, I really didn’t want to be seen portaging, dang it! And I also knew I’d have to launch back into the surf to make it around the jetties to get to camp as the sand was too deep for too long to drag there. The mansfield jetties was a magtag with the SE waves bouncing off them and they were pretty stacked up in one place but once thru it was gonna be easy the rest of the way. The sun was setting, the water was really dirty, the waves had teeth on them and I had to paddle right into them jaws and not get sideways or things were gonna get messy quickly and it was gonna eat me up and spit me out on the rocks. Me and my boat have been doing pretty good together and we had no problem punching thru, rounding the jetties, and taking the swells on in, finally turning back into the shore and ending at camp 1 in the calm waters of the cut. It was getting dark, and like so many other times, I was to set up camp in the dark. I wasn’t at all hungry but knew it was time to eat before hitting the sack but it would have to wait a while. This high energy paddling doesn’t allow eating solid food until I can relax quite a bit. During the day I use a powered protein mix that is like a thick shake and it’s much easier to take liquids than solid food. I have to take in fuel somehow and this is my secret weapon learned from the racing crowd on paddle24/7 . Pulling in and meeting the fellow TX200 crowd was a nice change. Usually I’m solo and pull into a deserted camp. It has it’s pros and cons but it’s always fun hanging out with others. I meet John Wright for the first time after chatting with him online and can see that we can just talk the whole nite away but I still got my camp chores to do and finally eat so it was time to get after it. I get water boiling, make dinner and get a chance to hang out with everyone right before they all turn in. I eat dinner around 10:30 and get to bed around 11. In the morning I don’t make a rush to get out of camp which may or may not have been a good thing. I wasn’t sure exactly how the trip back was going to go. A straight shot into the night and get back late? A two day, more relaxed pace? But then, I really didin’t take into account what mother nature had in store for me and she had her own ideas on what I should do. It’s tuesday and I had a big job on thursday. I had time to get back, if ….. and that became the big IF later on. Once I found my way thru the spoil islands I made a run for the ICW. It was a big day, lot’s of wind, big, then huge waves, but that wasn’t the killer, it was the current against the spoil islands next to the ICW. There was such a long fetch that the water stacked up on the spoil islands and created this big time current. The waves and wind were bad enough, but the current made it so I was not making much head way. It was time to re think this plan. I could go back out into the bay and get out of the river and just deal with the wind and waves and take all my time getting back, maybe in time for my job, but I’d be beat. I’d need wednesday to rest up so that I could perform on thursday. Dang it, I would have to abort ? I had to chew on this for a while …… and checking the time, and making phone calls it was decision time, and time to pull the plug on this trip. I was to meet my friend David in Port Mansfield in 2 hours for a ride back to spi. It was heck of a ride getting there but this time with the wind, waves and current in my favor I was really smokin’ my way back to port. In the big steep waves I was able to surf, and once surfing one, picked up speed to catch the next, and the next and so on. I was really moving along, and if anything, this was the highlight of the trip! I got back in like 90 minutes, a time that kind of blew me away. I also knew it was the end of the trip so I can pour it on and not worry about blowing the engine or transmission and I had a day of rest coming up before the job on thursday. I’m sure the fishing boats were wondering just what the heck I was doing out on a day like that. What a mess it was! If only I was headed to the land cut to start with, wow would that have been fun! So what plan was it I was on now? Anyway, more lessons learned, a new route was blazed, Fun friends were met, new gear was tested and some serious workouts were had. Stack all this up and lets head towards the next goal! My job on Thursday was 5 straight hours of giving lessons, three back to back to back. I give it my all on each lesson and it was nice to have that wednesday for rest as I was pretty tired when the sun went down that day. Friday was another rest day mostly but I wanted to get up to SeaDrift and catch up with everyone at the finish. I wish i had left earlier on saturday morning because I missed a few people by being late and I wanted to drool over those wooden kayaks some more. Oh well. Next year? I think I’ll be doing the TWS next year so will I have enough umph to do the Tx200 right after that? Most likely not. This time of year events get too tightly scheduled so I got to pick and choose. Now that I’ve done 35 miles up the texas coast on the outside, I know I can do the whole coast so that’s now on the list as well. I got other big trips in the works as well so we’ll have to see how it all pans out. Hopefully not like this year with one change after another.